This REHVA Task Force proposes a technical definition for nearly zero energy buildings required in the implementation of the Energy performance of buildings directive recast. Energy calculation framework and system boundaries associated with the definition are provided to specify which energy flows in which way are taken into account in the energy performance assessment. The intention of the Task Force is to help the experts in the Member States in defining the nearly zero energy buildings in a uniform way. The directive requires nearly zero energy buildings, but since it does not give minimum or maximum harmonized requirements as well as details of energy performance calculation framework, it will be up to the Member States to define what these for them exactly constitute. In the definition local conditions are to be obviously taken into account, but the uniform methodology can be used in all Member States. The directive defines nearly zero energy building as a building that has a very high energy performance and requires the calculation of primary energy indicator. The nearly zero or very low amount of energy required should be covered to a very significant extent by energy from renewable sources, including energy from renewable sources produced on-site or nearby. Based on the directive’s definition, nearly zero energy building is technically defined through the net zero energy building, which is a building using 0 kWh/(m² a) primary energy. Following the cost-optimality principle of the directive, nearly net zero energy building definition is proposed as national cost optimal energy use of > 0 kWh/(m² a) primary energy. In order to end up with proposed general definition, it was needed to clarify which energy flows shall be included in energy performance assessment and how the primary energy factors should be used for primary energy indicator calculation. For the uniform methodology, a general system boundary definition was established with inclusion of active solar and wind energy, as well as the guidance for technical meaning of “nearby” in the directive. The Energy performance of buildings directive recast (EPBD recast) came into force on 9 July 2010. Member States shall adopt and publish, by 9 July 2012 at the latest, the laws, regulations and administrative provisions necessary to comply with most of the articles. According to the Directive the Member States shall ensure that by 31 December 2020, all new buildings are nearly zero- energy buildings; and after 31 December 2018, new buildings occupied and owned by public authorities are nearly zero-energy buildings. information on the policies and financial or other measures adopted in the context of for the promotion of nearly zero-energy buildings. NOTE 1. A nZEB is typically a grid connected building with very high energy performance. nZEB balances its primary energy use so that the primary energy feed-in to the grid or other energy network equals to the primary energy delivered to nZEB from energy networks. Annual balance of 0 kWh/(m² a) primary energy use typically leads to the situation where significant amount of the on-site energy generation will be exchanged with the grid. Therefore a nZEB produces energy when conditions are suitable, and uses delivered energy during rest of the time. NOTE 1. The Commission shall establish by 30 June 2011 a comparative methodology framework for calculation of costoptimal levels (EPBD recast). NOTE 2. Not all renewable energy technologies needed for nearly zero energy building have to be cost-effective, if appropriate financial incentives are not available. calculated or measured amount of energy delivered and exported actually used or estimated to meet the different needs associated with a standardized use of the building, which may include, inter alia, energy used for heating, cooling, ventilation, domestic hot water, lighting and appliances. NOTE 1. According to EPBD, the energy performance of a building shall be expressed with a numeric indicator of primary energy use, based on primary energy factors per energy carrier, which may be based on national or regional annual weighted averages or a specific value for on- site production. NOTE 2. Appliances (households and outlets) are added to the original definition of EN 15316-1:2007. NOTE 1. net delivered energy values are expressed separately for each energy carrier, i.e. for electricity, fuels, district heat, etc. NOTE 1. The CO2 emission coefficient can also include the equivalent emissions of other greenhouse gases (e.g. methane). A recent benchmarking study on implementation on EPBD 2002 by REHVA (Seppänen & Goeders 2010) revealed a large variation in the technical regulations of the different countries. These differences in regulations have a significant effect on the building industry, and complicate manufacturing, sales, installation, construction and design of buildings in the common market area. REHVA experts have realized the problem various definition of nearly zero energy building may cause in Europe. An important issue is how to define the various energy flows and how to establish the energy boundaries on the building. This paper reports the results of REHVA Task Force “Nearly Zero Energy Buildings”. REHVA hopes that this report that focuses on definitions and energy boundaries will help the experts in the member states in defining the nearly zero energy buildings in a uniform way. This would help in understanding the policy options and in exchanging information of most energy efficient technical solutions for buildings. The following general definition format is proposed to clarify the exact technical meaning of EPBD recast requirements in order to support national implementation. EPBD recast requires nearly nZEB buildings, but since it does not give minimum or maximum harmonized requirements as well as details of energy performance calculation framework, it will be up to the Member States to define what these for them exactly constitute. The following proposal includes energy calculation framework specifying how to define the various energy flows and how to establish the energy boundaries on the building, affecting the performance levels of nnZEB building definitions. This guidance will help the experts in the member states in defining the nearly zero energy buildings in a uniform way. Nearly net zero energy building definition shall be based on delivered and exported energy according to EPBD recast and EN 15603:2008. The net delivered energy, which is delivered minus exported energy per energy carrier, is shown in Figure 1 and described with detailed system boundary definition in Ch. 3, Figure 3. This system boundary definition is a general form modified from the one of EN 15603:2008. 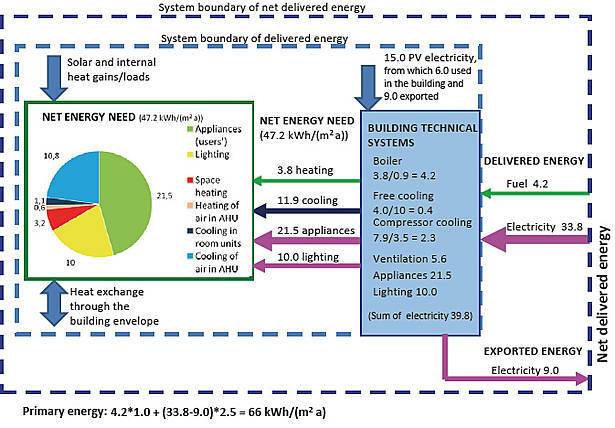 Suggesting the inclusion of energy use of appliances (households and outlets), the system boundary proposes that all energy used in buildings will be accounted in net delivered energy as well as in nearly net zero energy building definition. According to that, energy use in the buildings includes inter alia, energy used for heating, cooling, ventilation, hot water, lighting and appliances. The last one is an amendment compared to EPBD recast definition shown in Ch. 3. From net delivered energy, numeric indicator of primary energy can be calculated and used to define the performance level of nearly net zero energy building. Primary energy indicator (called often also as primary energy rating) sums up all delivered and exported energy (electricity, district heat/cooling, fuels) into a single indicator with primary energy factors. In a similar fashion, numeric indicator of CO2 emission may be calculated with CO2 emission coefficients. CO2 indicator provides additional information about the consequences of energy use, in the terms of CO2 emitted to atmosphere. Figure 1. System boundary for nearly net zero energy building definition, connecting a building to energy networks. Net delivered energy is delivered Edel,i minus exported energy Eexp,i accounted separately for each energy carrier i. 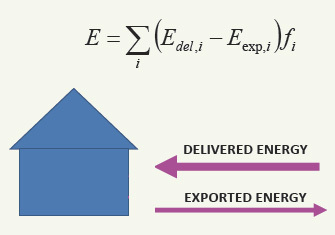 Primary energy E is calculated with primary energy factors fi (the same factors are assumed for delivered and exported energy carriers in the figure, see Equation 1 for more details). which all affect calculated or measured primary energy indicator. For the national definition of nearly net zero energy buildings, the performance levels of E-values should be specified for each building type, at least for those listed in EPBD recast. According to these EPBD recast definitions, electricity for households and outlets are not mandatory to be included. All other major energy flows are mandatory to be included. The energy performance of a building shall be expressed in a transparent manner and shall include an energy performance indicator and a numeric indicator of primary energy use, based on primary energy factors per energy carrier, which may be based on national or regional annual weighted averages or a specific value for on- site production. The methodology for calculating the energy performance of buildings should take into account European standards and shall be consistent with relevant Union legislation, including Directive 2009/28/EC. 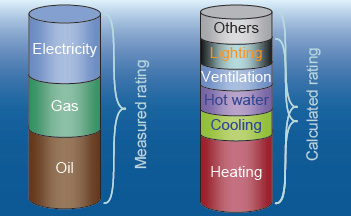 EN 15603:2008 discusses energy flows to be included in the energy ratings, Figure 2. It is upon national decision to take into account electricity for households and outlets or not. For the energy boundary specification, the guidance is provided in EN 15603:2008. This is mainly general guidance, and again, exact specification is let for national bodies. Inside the boundary the system losses are to be taken into account explicitly, outside they are taken into account in the conversion factor (=primary energy factor). Technical building systems located partly outside of the building envelope are considered to be inside the system boundary. It is also clearly stated that the assessment can be made for a group of buildings serviced by the same technical systems. EN 15603:2008 states that for active solar and wind systems only the energy delivered by the generation devices and auxiliary energy are taken into account in the energy balance (i.e. kinetic energy of wind is not). It is to be decided on the national level, if this energy is part or not of the delivered energy (Definitions, 3.3.4). Actually this will conflict with EPBD recast, if renewable energy produced on site is considered as delivered energy (meaning that there is no difference between on site solar electricity and grid electricity, and on site solar electricity is not reducing the amount of delivered grid electricity). In this case, there is conflict with EPBD recast, Annex I, that states that the positive influence of active solar and other renewables are to be taken into account. Thus, this national decision seems not any more relevant and EPBD recast has caused a revision need for EN 15603:2008. Proposed energy boundary is modified from EN 15603:2008 and as stated in EPBD recast, renewable energy produced on site is not considered as part of delivered energy, i.e. the positive influence of it is taken into account, Figure 3. Energy need represents energy need in a building for heating, cooling, ventilation, domestic hot water, lighting and appliances (if appliances are included in the system boundary as proposed). Energy need for heating is caused by heat losses and is reduced by solar and internal heat gains. Net energy need is the energy need minus heat gains, i.e. thermal energy without any system losses needed to maintain indoor climate conditions. For the lighting and appliances electrical energy is needed. Figure 3. 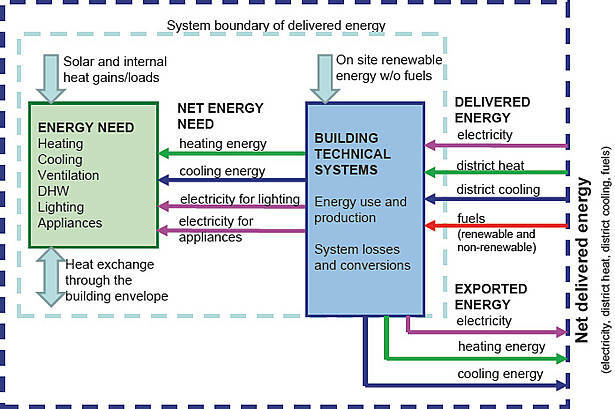 Energy boundary of net delivered energy and how it forms from energy need, energy use of technical building systems, on site renewable energy production, delivered energy and exported energy. The box of “Energy need” refers to rooms in a building and both system boundary lines may be interpreted as the building site boundary. Building technical systems supply the amount of net energy needs of heating, cooling and electrical energy. To supply these net energy needs, building technical systems use energy and have typically some system losses and energy conversion in some systems (i.e. heat pumps, fuel cells). The energy used by the building technical systems is from delivered energy to the building or from on site renewable energy (without fuels). Delivered energy to the building is grid electricity, district heat and cooling, renewable and non-renewable fuels. On site renewable energy without fuels is energy produced from active solar and wind (and from hydro if available). Renewable fuels are not included in this term, because they are treated as delivered energy to the building, i.e. off-site renewables. Energy from heat sources of heat pumps (air, ground, water) is also renewable energy, but this information is not needed for heat pump system and delivered energy calculations which are based on COP data of heat pumps. (However, energy taken from heat sources of heat pumps is needed for calculation of the share of renewable energy, which is additional information). On site renewable energy production systems may supply other technical building systems, thus reducing the need for the delivered energy to building, or may be directly exported to energy networks. This is taken into account in the net delivered energy balance. Net delivered energy is delivered minus exported energy, both expressed per energy carrier. Primary energy use is calculated from net delivered energy, per energy carrier, as product of primary energy factor and net delivered energy of that energy carrier. Figure 4. Calculation example of the energy flows in nnZEB office building. The building has a gas boiler for heating with seasonal efficiency of 90%. For the cooling, free cooling from boreholes (about 1/3 of the need) is used and the rest is covered with mechanical cooling. For borehole cooling, seasonal energy efficiency ratio of 10 is used and for mechanical cooling 3.5. Ventilation system with specific fan power of 1.2 kW/(m3/s) will use 5.6 kWh/(m² a) fan energy. There is installed a solar PV system providing 15.0 kWh/(m² a), from which 6.0 is utilized in the building and 9.0 is exported to the grid. Energy calculation results are shown in Figure 4, in the building technical systems box. Gas boiler with 90% efficiency results in 4.2 kWh/(m² a) fuel energy. Electricity use of the cooling system is calculated with seasonal energy efficiency ratios 10 and 3.5 respectively. Electricity use of free cooling, mechanical cooling, ventilation, lighting and appliances is 39.8 kWh/(m² a). Solar electricity of 15.0 kWh/(m² a) reduces the net delivered electricity to 24.8 kWh/(m² a). Net delivered fuel energy (caloric value of delivered natural gas) is 4.2 kWh/(m² a). From these two net delivered energy flows, primary energy is calculated with the result of 66 kWh/(m² a). Energy performance definition of EPBD recast was followed so that appliances (households and outlets) were included, i.e. all energy used in buildings would be accounted. For the system boundary definition, a general form modified from the one of EN 15603:2008 is proposed. It is proposed to the Member States to use the system boundary shown in Figure 3 and primary energy definition given by Equation 1 in defining the performance levels of nearly net zero energy buildings. which all affect calculated or measured primary energy indicator. The performance levels shall be specified for each building type, at least for those listed in EPBD recast. EN 15603:2008 Energy performance of buildings – Overall energy use and definition of energy ratings. EN 15251:2007 Indoor environment input parameters for design and assessment of energy performance of buildings addressing indoor air quality, thermal environment, lighting and acoustics. ISO 15927-4:2005 Hygrothermal performance of buildings – Calculation and presentation of climatic data – Part 4: Hourly data for assessing the annual energy use for heating and cooling. Seppänen O, Goeders G. Benchmarking Regulations on Energy Efficiency of Buildings. Executive summary. Federation of European Heating, Ventilation and Air-conditioning Associations – REHVA, May 5, 2010.